Last weekend I ran in my second Komen Race for the Cure 5k. I fell in love with this event last year – there is just something so electrical about 45,000 women gathered in one place, for one cause, with one purpose. There are men and children there too, but it is the girl power that I especially feed off of. This year, this was doubly true, as I fed off of the girl power of the entire crowd, but also of one specific girl in particular that I did not expect. I challenged myself to run the 5k in less than 27 minutes, knowing that it would motivate me for training and also get me a spot closer to the starting line (faster runners wear colored race numbers that gain them entry to a “corral” at the front of the massive start). After eight weeks of helter-skelter training, I found myself standing on the starting line, feeling nervous about whether I would meet my goal or not. 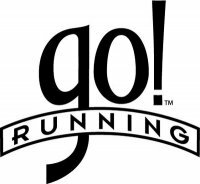 I was intimidated by the other runners around me, who all seemed to be either very tall, very skinny, or both, and many of them were equipped with iPods or GPS units – obviously all somewhat serious runners. I had visions of the gun going off and all these runners taking off, leaving me trailing behind like a three year old trying to catch the ice cream truck. I stared down at my $9.99 “sports” watch from target, queuing up the timer function while listening to the conversation around me. One woman, dressed in a chilly looking red singlet and shorts, was asking the people around her what their goal times were. It didn’t make me feel better when several answered, “24”, “22”, “23”… But then I heard this woman say that she wasn’t going to go that fast and that she was just getting back into running after having two kids. I looked up at her, and she asked me what my goal was. “I’m getting back into running after two kids too. I hope to be at 27 or 28 minutes, ” I said. Our conversation was halted by the suddenness of the countdown to the start gun, after which I got lost in the blur of trying to get out fast, not trip on anyone or myself, and trying to squint enough to stop the wind from forcing water out of my eye sockets and down my cheeks while still being able to see where I was going. After what seemed like only a few short minutes of crossing the bridge over the Arkansas River; under the mayor of North Little Rock, who was hoisted high above the street in the bucket of a “cherry picker” truck; through a pleasant storm of pink and white confetti; and past a couple bands, I became aware of an amplified man’s voice yelling out times in the urgent, yet matter-of-fact style of a high school track coach. “Seven Eighteen! Seven NINEteen! Seven Tweeeenntty!” I wondered why someone would be yelling out run times at this point in the course, until I finally located the voice on the sidelines and saw that he was standing next to a huge banner that said ” 1 MILE”. I was stupefied. I had just run the first mile in 7:24?! I blinked and looked around, shocked again to find that I had just run up next to the woman in red. “I think we ran that first mile a little fast,” I said. She agreed, but we didn’t drop our pace. We continued on, taking in the sights of the race: firefighters dancing atop their trucks, bikers revving their bike engines, karate kids, marching bands, belly dancers and yogis, and of course, the wonderfully enthusiastic “regular” spectators. We introduced ourselves – her name is Lindsey. She introduced me to other runners that we passed and who passed us along the way. We carried each other along in that magical way that only runners know about. I was amazed at our progress when we made the turn onto the last straight stretch of the course. We ran past Lindsey’s husband and son, who offered her the cutest little dixie cup of water. I started to wonder where my husband and children were, and then I finally glimpsed them as we neared the finish line. Waving with both hands to Carina, Callen, and Craig, I crossed the finish line right next to Lindsey with a time of 25:16. Even though I am trained in communicating through written words, I still can’t find the right ones to explain why I love to run, or the feeling that a great experience like the Race for the Cure gives me as a woman and a runner. I am so blessed to have my health, my abilities, and most importantly, to be surrounded by wonderful people (family and new running buddies included) to share it all with. Breast cancer is a scary, scary thing. It’s hurting our mothers, our sisters, our friends, and therefore, it’s hurting all of us. 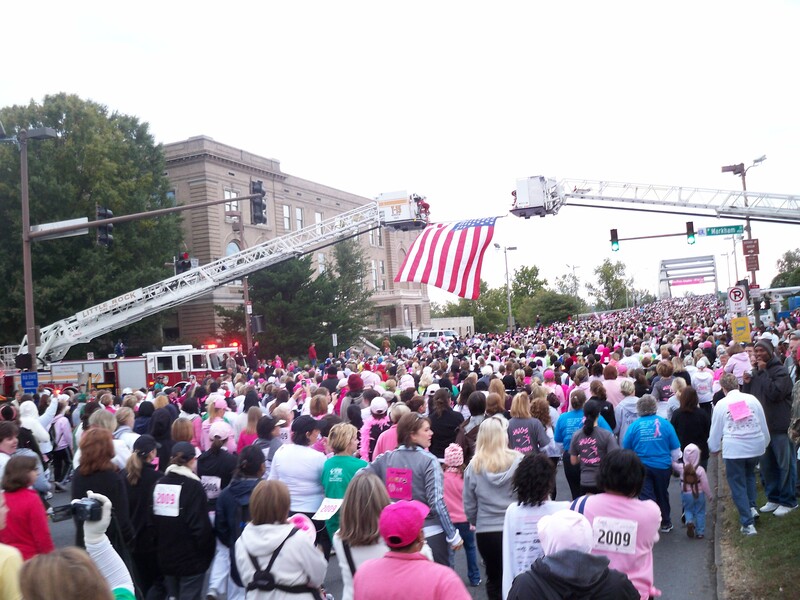 The 2009 Race for the Cure is finished, but the battle continues. You can fight it right at home. Forward this link on to anyone you know who has breasts, or anyone who loves someone who does. It’s a form to sign up for a monthly email reminder to do a self breast exam. Early detection is the best way to ensure survival! We’ve been living in Little Rock for nearly a year now, a fact that is made obvious by the repetition of some yearly events in the same setting. At the end of August, my daughter Carina will turn three. We’ll celebrate with a party at our house. Her second birthday a year ago was the first party we had in our new home. Like all parents, I am amazed by and proud of the growth and development my baby, nay toddler, nay little big person has achieved over the past year. 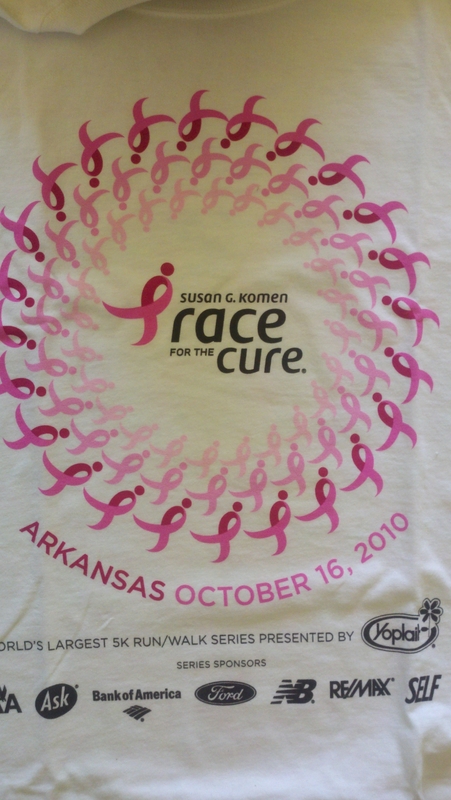 I’m also gearing up for this year’s Susan G. Komen Race for the Cure, which was the first large event I experienced in downtown Little Rock last fall. To call it a “large event” is an understatement. It was probably the absolute most amazing sporting event I have ever been to. I’m not even sure you classify it as a sporting event so much as a mixture of many things, a culmination of sisterhood, a rally for the greater good, a huge party, a vehicle for awareness, an inspirational journey, a sea of pink, a memorial, therapy, a fundraiser, and a call to action. There were over 45,000 women that ran or walked in the race. There were thousands of spectators cheering, including bands; firefighters on top of their trucks; people handing out water, beads, leis, and bracelets; kids doing karate; and my favorite, a group of motorcycle riders revving their engines and holding a sign that said, “Save Second Base!” It was so amazing that it was over before I had a chance to really take it all in. I do remember running and feeling thankful that I could run. I thought of the women I was running in celebration of – the fighters, the survivors, and those who will never be forgotten by the loved ones they left behind. I thought of my family and how lucky I am to have such a wonderful husband and two fantastic kids. After the race, I met up with my family and we watched the survivors’ parade, which featured breast cancer survivors dressed all in pink and holding signs that said how long they had been cancer free. It made my skin tingle. As I held tightly to my daughter perched on my shoulders, I said a silent prayer that she will not have to worry about breast cancer – a prayer that all the effort and energy will be fruitful and a cure will be found. This year, I’m older and wiser, and so am hoping to be able to take it all in a little better. I’ll spend less time looking at my watch during the race, and more time enjoying my surroundings. I’ll head down to the festivities even earlier in the morning, and perhaps stay a little later. I’ll make another year of memories, and in the process, hopefully help put us another stride closer to the finish line in The Race for the Cure. Whether you walk, run, or cheer from the sidelines, I’d love it if you’d join me.